Recording contracts with RIAA companies are more or less equivalent to signing away your payday. Many smaller acts, even those who tour frugally, end up in debt because of the contract they signed regarding promotional costs and so on. The recording/music publishing industry as a whole does a really neat trick of making it look like they are doing the band a favor, making them work their tails off, and still have to pay for the privilege of having a contract. Standardized tests for Higher Education? A federal panel has recommended that standardized testing be implemented at all public colleges. Read more about Standardized tests for Higher Education? So, the total site overhaul is nearly done. There are a few cosmetic issues to clear up regarding various cosmetic, and some accommodations that I need to make for folks with display resolutions at or below 1024x768. Mostly, that pertains to the front page portal, since the rest of site generally degrades reasonably under a host of conditions. Right: leftovers in fridge, insufficient quantities of Spam and pseudo-seafood salad to make much of a sandwich independently. Combine. Stare dubiously for 30 seconds. result: tastes like chowder with bacon in it. Filed away in case of desperation/divorce/unwanted guests. I've been tinkering with pagan and ceremonial magick (1) for about 14 years. My studies and practice have not gotten as far as I'd like in terms of traditional study, and I've finally made a commitment to myself to pursue my studies on a more regular basis. Sometimes, waiting for a very long time adds up to unrealistic expectations. Every once in a while, we get lucky, and the expectations are not only met, but exceeded. Every once in a while I see something that makes me think that everything is going to work out in the end. This was once of those moments. 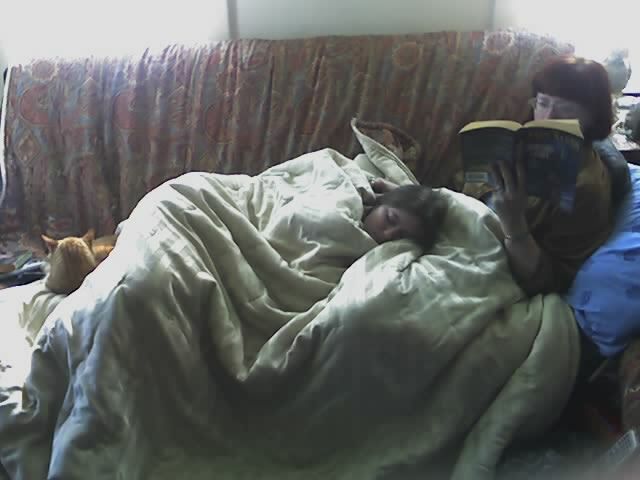 When I came into the room, kess hushed me and pointed to sleepy Drae. It's the sort of quiet moment that they rarely share, with a lot of stress and conflict in between. Mostly silent conflict, sometimes not. But moments like this — yeah, they keep me going. This was posted by me as a response to a story on Macsimum News. In the interest of equal time, Dennis Sellers posted an article written by a reader ( "John") stating that network neutrality is a Marxist notion, and is therefore bad. Even aside from the fact that it's a pretty stupid position to try to argue, John is also just plain wrong. If anything, network neutrality is an infrastructure level policy that actively encourages greater choice, and is thereby in line with, and supportive of, the capitalist free-market ideology. UC Berkley has opened up their iTunes U course audio to the general public.